Welcome to 2018! As the holiday break is quickly coming to an end, I figured there's no better time to catch up on the blog writing. It's been 4 months since we were in Iceland, so I'd better write the travelog before memories started to fade on me. Picture below: The majestic Gullfoss. Day 1: flew into Reykjavik. Upon arrival, explore the city. Day 2: Southern Iceland including Eyjafjallajökull Volcano, Solheimajokull Glacier, Vik, Skogafoss and Seljalandsfoss waterfalls. 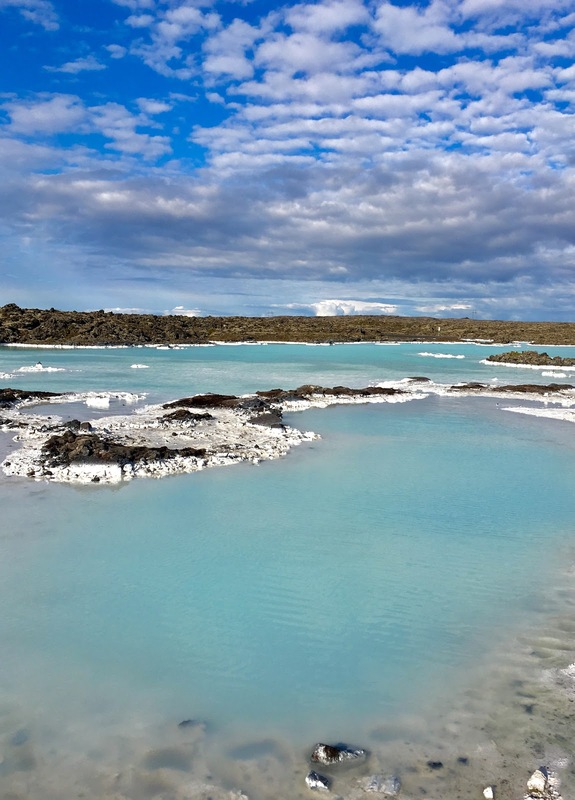 Day 3: Gullfoss, Geysir and Strokkur hot springs. Day 4: Reykjavik, Blue Lagoon. Reykjavik is a very small city so if you really want to pick up your pace, you can see most sights in half a day. Hallgrímskirkja is probably the most iconic landmark in Reykjavik. 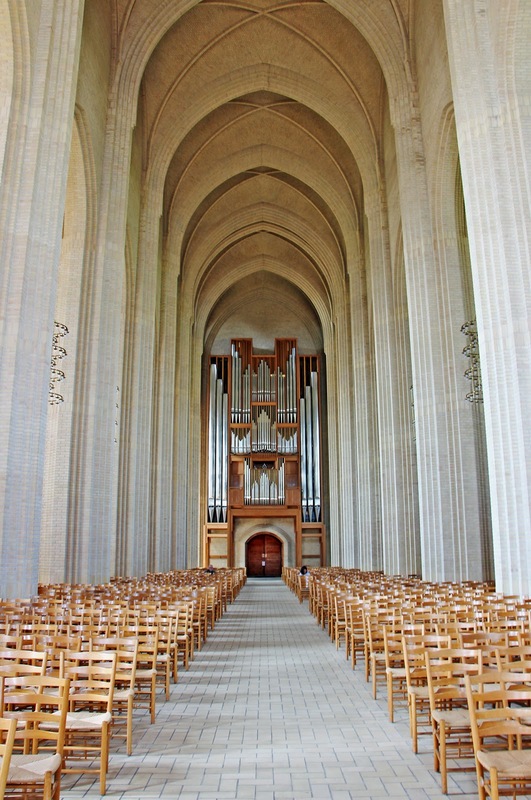 The design of this Lutheran church is similar in style to the expressionist architecture of Grundtvig's Church of Copenhagen. Picture below: pipe organ inside Hallgrímskirkja in Reykjavik. Picture below: pipe organ inside Grundtvig's in Copenhagen. From the Hallgrímskirkja clock tower, you can get a nice aerial view of the Reykjavik city centre and the streets lined with colourful houses. We spent quite a bit of our time inside Reykjavik near the Old Harbour area. It's highly recommended to take your time and take in all the otherworldly views from near and far. Picture below: not really sure if they are called Laufskalavaroa which literally means stacked lava stones, but you will see numerous stacks of them at the Old Harbour near Harpa. The porous volcanic stones make it easier for them to stack against one another. Some are so topsy-turvy that you wonder how it's even possible for them to still take shapes with all the winds and weathering. Pictures below: Harpa Concert Hall and its beehive-alike glass panels. Our first stop outside the city was the Skogafoss, about two hours drive from Reykjavik in the south end of Iceland. Skogafoss is one of the biggest waterfalls in the country with a width of 49 feet and a drop of 200 feet. We arrived at around 11am, and thanks to the angle of the sun shining at the misty falls, we saw double rainbow! This was the first time in my life I was so close to a double rainbow, so close I could almost touch it. In the afternoon as we made our way back north, we stopped at the Seljalandsfoss. Guess what we saw again? Double rainbow! 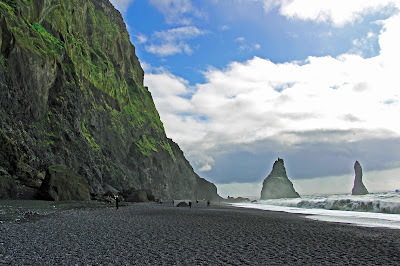 We took our lunch break in Vik, at the famous Reynisfjara Black Sand Beach. The entire beach is covered with these small river rocks, so make sure you wear very cushy and comfortable shoes. I was able to capture the infamous "sneaker wave" in action from a safe distance. After lunch before heading to the Seljalandsfoss, we also made a stop at the Sólheimajökull Glacier. It was a very humbling sight to see how human beings compared to the size the Glacier. Day 3: we covered the so called Golden Circle. Picture below: hiking down to the Gullfoss. Picture below: Iceland's largest fountain geyser Strokkur erupting. It took a bit of patience and luck, but don't worry, if you miss one, all you need to do is to wait for 5-8 minutes before the next eruption. Day 4: this wasn't planned but my bestie from Copenhagen, who rendezvoused with us in Reykjavik, suggested that we spent an afternoon at the Blue Lagoon. I am so glad I went. If you are a foodie, you won't be disappointed with Iceland. We arrived into Reykjavik in the early morning so our first stop was Cafe Paris where we grabbed our first meal/brunch. We didn't choose the restaurant for any particular reason. Nor did we do any research on it beforehand. We went because it had tables available and was steps away from our hotel. It turned out that the service was excellent and the food amazing. I am sure you know how expensive things can get inside Iceland. Two bowls of these modest Pho would set you back by $50. If you found yourself in the Old Harbour area and needed a spot to grab a quick lunch, I highly recommend Ramen Momo. It's run by two Tibetan guys who took their training in Japan and ended up with a restaurant in Reykjavik. We went back to Cafe Paris for dinner with my girlfriend and her family. The French cuisine was pretty authentic, but I have to say all the dishes were on the greasy side. It was completely unexpected but my girlfriend brought with her a ton of Georg Jensen decor accessories for my Scandinavian style cottage! My heart literally exploded with happiness. She is a girl after my own heart! While in Reykjavik, we stayed at the Kvosin Downtown Hotel. The location was fantastic and the hotel room clean and spacious. Don't be surprised that a Queen bed means two singles pushed together - it's very common in the Nordic countries where practicality is key. It's also very common for hotels to put out two single duvets - they are firm believers of a good night sleep so single duvets serve that purpose. I appreciated all that but one thing I couldn't wrap my head around was the separation of a shower stall and a washing closet (it's literally the size of a small closet with a toilet and a washing stand). Picture below: our suite comes with a kitchenette with a pretty blue island like this. Those pendant lights are from Restoration Hardware. The hotel put out their daily complimentary colourful donuts for the guests, and guess who took full advantage of that and had these super cute donuts for breakfast almost every day? Every other person I talked to these days told me Iceland is on their bucket list. I can speak from my own experience is that Iceland is a must-go for those who love to travel. The landscape left me in awe, and wanting to immediately go back for another trip.